UPDATED (8/17/09): Congratulations to reader Tammy, who was randomly selected as the winner of the prize pack. Thanks to everyone who entered. UPDATE (8/10/09): Due to overwhelming demand, General Mills has run out of the free coupons (mentioned below), but you can still call to get more information on the company's gluten-free products. It’s been a couple of months since the debut of Betty Crocker’s four gluten-free dessert mixes: yellow cake, devil’s food cake, chocolate chip cookie and brownie. Wegmans was the first local supermarket to stock them, and other stores have since started carrying the products. (They’re also available at Amazon.com.) All of the mixes are made in a gluten-free processing facility. If you haven’t yet had a chance to try them, now’s your opportunity to do so; if you have, you can stock up on more! 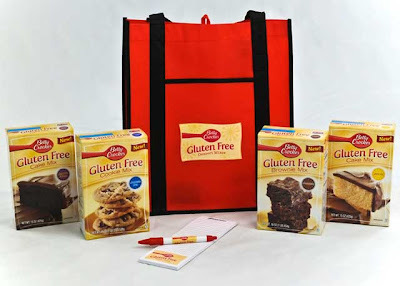 As part of Gluten Free Philly’s latest giveaway, one lucky reader will win a Betty Crocker “Sweet Treats” prize pack. The prize pack includes all four dessert mixes, two “free product” coupons for any of the varieties, and a “Betty Crocker Gluten Free” grocery tote bag, magnetic grocery list and pen, all courtesy of MyBlogSpark. In addition to entering the giveaway, you can call General Mills at 1-800-446-1898 to request a coupon for one free mix of your choice and to receive information about the company’s growing number of gluten-free products. To enter the giveaway, leave a comment to this post letting me know which one of the mixes you like the best (if you’ve tried them) or which one you’d like to try the most (if you haven’t had tasted them yet). The giveaway runs now through Sunday, August 16 at 11:59 p.m. Eastern Time. I’ll randomly select one winner the next day and will contact them by email. If I don’t hear back from the person with his or her mailing address by the following Tuesday at 8 p.m. Eastern, I’ll select another name. My husband and 7 year old son are Celiacs and my 4 year old is a gluten intolerant. My 10 year old and myself choose to follow the diet and feel so much better! We have tried some of the mixes. I like the brownies the best. It is so nice to finally be able to buy a "boxed" brownie mix that tastes like a boxed mix. It's also nice to have wonderful friends that can make them too. Great contest!!! We have tried all 4 and like them all, but the cookies rock!!! Both my son & I are gluten-free. My 11 yo daughter has celiac. Last night we were shopping at Harris Teeter and saw the Betty Crocker mixes. She picked the brownies and yellow cake but we haven't tried them yet. michelen6[at]bellsouth[dot]net. I like the brownie mix the best and I would really like to try the devil's food cake. We like the brownies the best. They are delicious. Can't tell the difference. I think it's great that the gluten free diet is being recognized by major manufacturers. I wish they recognize dairy allergies as well! I'd like whatever mix is dairy free, if any are. Otherwise I'd like the yellow. I love the brownies, but I really want to try the cake mixes! We LOVE the Brownies and the chocolate cake mix. The yellow cake mix was ok, and I need to try the cookies. Also wanted to share that Betty Crocker is out of coupons - and if you live near the new Target in Cheltenham, PA, they are carrying all 4 of the Betty Crocker mixes, which is just awesome! I loved the brownie mix. Yummy. The chocolate chip cookes were great too. I am very excited to try the cakes. So very happy to have Betty Crocker on board! We made the yellow cake over the weekend. I added chocolate chips and made cupcakes for a party. I watched as the other kids gobbled them up, having no idea they were different! My daughter was so proud that her special cupcakes were a hit! The flavor and texture were great. I've already put another box on my shopping list! I have not found the mixes in my area. I would like to try the brownies when they become available. I am a Celiac. I was diagnosed 11 years ago. There wasn't much available at that time. I would love to make the devil’s food cake for my husband- thanks so much! I was so excited when I heard about the new Betty Crocker products! I want to try them all but a moist chocolate cake would be my first choice to try since I have only had one good chocolate cake since I was diagnosed with celiacs last year. I haven't found the mixes in any local stores near me yet - waiting for a Wegman's to open in Collegeville, PA in October (yeah!). My daughter has Celiac's and our family would love to try the Betty Crocker chocolate chip mix. I have been living with Celiac/ Sprue since 1996 and have seen so many positive changes -the most delicious one is the BettyCrocker Yellow Cakw Mix. It is simply the best!Moist,delicate, light and taste sooo homemade . I also made the other three mixes and my entire family did not believe me when I said they were gluten free and from a box.. Betty Crocker you are the best!!!!!!! My 5 year old adopted daughter is celiac. We especially want to try the yellow cake mix; I have yet to find one that is decent and my daughter asks for yellow cupcakes, so I'm hopeful Betty Crocker has a winner! I made the brownies last night and they are great. I will keep a box in my pantry to have something to mix up quickly. The convenience is so nice. Ok I'm going to give this a try. Yes I tried the Betty Crocker vanilla cake mix and liked it very much. Making it took me back to my gluten days and making a box cake. Anyway, the BC cake was pretty good and I iced it with chocolate frosting, everyone liked it including the nonceliacs. I hope BC comes out with a gluten-free angel food cake mix next! Sorry to post as anonymous, but it would not work otherwise! I am celiac - but I love the brownies the best! Haven't had a chance to try the cake mixes though. Thanks for offering this! I bought the cookie mix at Pathmark in Cheltenham. I made the dough and put it in the fridge for the next day. My non celiac 7 year old ate half the dough! The next day it was a little dry, so instead of cookies, I made cookie bars in an 8x8 pan. They came out great, with a nice combination of crisp and chew, and very sweet. I would love to try the chocolate cake (devil's food)next! My only disappointment is that I have a family of 6 and the mix only makes an 8x8 pan. I usually hord it for myself(I'm the only celiac so far in the family) but would love to be able to share! We had the brownies last night- yumm yumm! The mixes are now available at the Langhorne Target(being converted to a SuperTarget)!! I am having trouble now with other grains, but I tried the yellow cake mix, poked holes in it after it was done , poured sweetened condensed milk on it and fresh strawberries and it was the Bomb!! I just can't explain how good it was!! I have been gluten free for 1 and a half years after being dignosed with Ceiac disease. AS you all know it was hard at first and I still have my bad days. I have a gluten free kitchen and my husband eats the same way I do. I did miss my cakes and cookies and Thank God Betty Crocker is making gluten free mixes. It was a name I used before celiac..my e-mail is countrymamaw93@yahoo.com , I don't know anyone else in my town in Ohio who is gluten free so I read all the blogs and meet new friends here. Thank you. Thanks for posting this. I was so excited, to say the least to find 2 of the gf mixes at our local Jewel, but then even more excited to find all 4 of them at our regular grocery store! My 3 year old grandson and I baked cupcakes for my birthday with the chocolate cake mix- he took 4 home for mama, ta-ta, mow-mow the cat, (rhymes with wow-wow), and him. I shared one with my son and one with his girlfriend. Needless to say, somehow or another the other 12 disappeared- might have had something to do with me grabbing one each time I walked past them on the table :). I haven't tried the rest of the mixes yet, but I was soooo proud of myself for baking something that turned out really good! If the rest of the mixes turn out just as well, I will be in gf "heaven"! This is a great contest! I was diagnosed with Celiac Diease 10 years ago and am thrilled that it is becoming easier to find Gluten Free items. Next time I am at Wegman's, which is about 40 minutes away, I will be sure to look for the new Gluten Free Betty Crocker mixes. I can't wait to try the brownies. My GF baking has improved so much that I gained weight. So I am having a contest with my husband over the summer to get it off. But I plan to celebrate with a brownie sundae this fall. Please enter me in your contest. I'm not suffering with the weight loss diet. Fruit is fantastic in Michigan. I have combined the cookies with the brownies in one big tin and wanted to eat the entire thing it was so good. I definitely want to try the cake mixes, but can't find these products at any of my local supermarkets so I can only buy it in bulk. I would love to win this prize so I can enjoy dessert with the rest of my family. The brownies are great but try the choc-chips cookies pan style with pecans....just try to eat only one !!! Both passed the non- Gluten family members test and you should have seen their eyes when I popped a piece in my mouth. Note I did leave in oven to cool if center was a little wet due to cooking times because of pan size this way they didn't get dark are dryed out. I was diagnosed with Celieac 2 months ago..WOW.. what a change, 41 years old and love my bread, pastas and all the things NOT GF.! !, I had the Betty Crocker cake mixes for my birthday in July. I had the Chocolate and the Vanilla. Personally, I liked the chocolate better.. It was fluffier than the vanilla, the vanilla was more dense. Try it in a Bundt pan and drizzle the icing around the top and drip down!! YUMMY... I am a cake maker myself..It's tough!! I've been gf for 10 months now - when I first was diagnosed, an uncle commented: "Wow, how's that for karma... the baking queen can't eat it anymore!" It's been a hard 10 months, interspersed with a few moments of hope when I would finally find something that tasted somewhat like my old life. I had one of those moments when I got my hands on the Betty Crocker mixes - even the boxes look familiar and friendly. I am IN LOVE with the chocolate chip cookie mix. My fiance, who is not gluten-free, has given his blessing to buy that puppy in bulk and bake them whenever a craving hits. Reading the note from the Betty Crocker people almost made me cry - how awesome they take it seriously and understand. Kudos to them. If you haven't tried the chocolate chip cookies yet, GO FOR IT! You (and your family, even the gluten-ous) won't regret it. Happy gf baking to you all!